This page is dedicated to the Las Cruces Vaqueros independent professional baseball team. It began play in 2010, the last season of the Continental Baseball League. The team went on to play several more seasons in the Pecos League. This content is copied/pasted directly from the old Las Cruces Vaqueros’ website (this page). All credit goes to the Vaqueros, Andrew Dunn, the Pecos League and any/all people who updated that website regarding the 2010 team’s results. The Las Cruces Vaqueros were founded by Andrew Dunn in July 2009 and began play in May 2010. The Vaqueros were in the Continental Baseball League Dunn had operated the Coastal Kingfish League Team in 2009 and was granted the Las Cruces Market for 2010 season. When the team was announced there was supposed to be an 8 team league with teams in Pueblo, Abilene, Alexandria, Monroe, and Big Bend. By the time the season started it was Las Cruces and Big Bend. Dunn agreed to bring the Coastal Kingfish back for the 2010 season and the Continental Baseball League agreed to operated the 4th team which Dunn named the Desert Valley Mountain Lions. This turned out to be a great thing for the Vaqueros. Very limited travel. The Vaqueros played hard and established a fan base. It would have been extremely difficult for the Vaqueros to travel to Louisiana with very limited sponsors in their inaugural year. Both teams made in through the season despite having to play against two travel pay to play teams in the Desert Valley Mountain Lions and the Coastal Kingfish. The Continental League was formed in 2007 and Las Cruces was supposed to be one of the charter cities in 2007 owned by the Chancellor of NMSU, he left NMSU to goto another college and the team fell apart. In 2010 we were excited to bring Professional Baseball to Las Cruces for the first time. We were in league that had problems but we are excited that we established a name and we are ready for the season to start. Alpine and Lass Cruces tied with idenitical records but true to form the Continental League made the Vaqueros travel to Big Bend to play the Championship Series the Vaqueros lost 2 games to 1. The Vaqueros promoted 7 players to higher independent leagues but had nothing left for the playoff run. 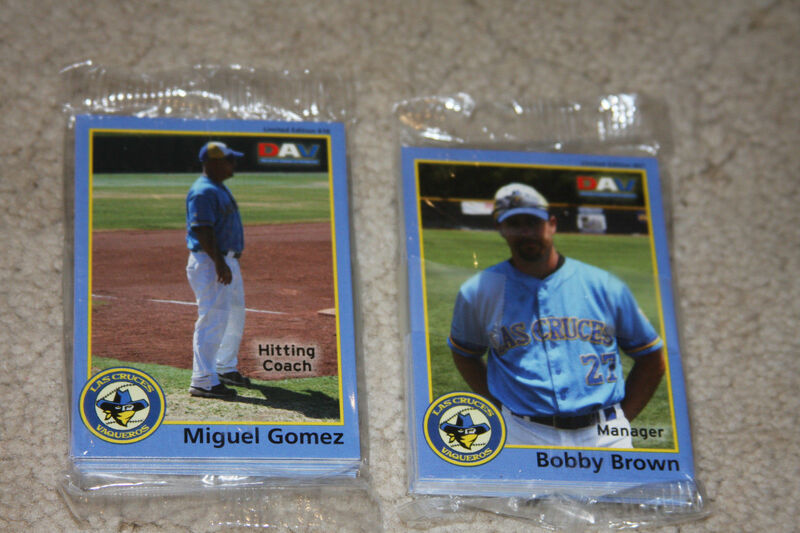 Bobby Brown was the field manager, Sean Kramer was the assistant coach, Holly McWatters from the El Paso Diablos was the GM. At the conclusion of the season the Vaqueros ownership received a slew of complaints about the way the team was run. We realize our local management staff was well under par for a professional level team and we have made big changes to correct this. Hiring El Paso people to run a Las Cruces business did not go well with the fans or the community. Game 12 Vaqueros 10 Kingfish 2 Series Finale. Game 11 Vaqueros 12 Kingfish 10 Series Finale. Game 10 Kingfish 5 Vaqueros 3 Series Finale. Game 9 Vaqueros 4 Coastal Kingfish 3Vaqueros outlast Kingfish is a tight Thursday Night Contest. Lamar Guy made his Vaqueros debut with a 6th inning homer and a bases loaded walk to end the game in the 9th inning. Game 3 Big Bend Cowboys 13 Vaqueros 5 Vaqueros drop Saturday Night Game. Las Cruces Vaqueros win first ever game! Thad Henderson’s pitch hit homer carries Vaquero’s to first ever victory, Cory Morales play excellent defense and had two hits. The first ever Vaqueros Game at Alpine, Texas. The Vaqueros did not have their hats in time for the game thus they had to wear Coastal Kingfish Hats. CB. The Vaqueros won their first two games beating Alpine in Alpine on Thad Henderson’s home run. Shane Weldon was first ever starting pitcher. The Vaqueros worn all powder blue Milwaukee Brewers style uniforms. In 2010 the CBL had committments for an 8 team league, Alexandria, South Louisiana Pipeliners, Tyler, Monroe in the East, Abilene, Pueblo, Las Cruces and Big Bend in the West…The South Louisiana Pipeliners owner Dave Angrone wrote the league an NSF entry fee check and vanished. This caused a domino effect that should have completely ended the league. Alexandria the league’s best market with drew and entered a team in the Texas Collegiate League. Tyler and Pueblo withdrew all together, Monroe’s owners joined the Yuma Scorpions and withdrew from CBL, Bay Area Toros filed bankruptcy. Abilene never had a stadium… This left two teams Big Bend and Las Cruces. Andrew Dunn and Ron Baron decided to continue operations and move forward. With all of the efforts and promises made to both cities, the Kingfish were brought back to life and the Desert Valley Mountain Lions were born, by having both teams it allowed limited travel and a 4 team all Western League. With all the work Baron did to keep the league alive, there was no future and limited promise outside of the West. With Ron Baron being based in Dallas he decided this would be his last year, but it is important to understand that without Ron Baron Las Cruces would have never had pro baseball… No league would have went into Las Cruces as an experiment. The City of Las Cruces should always be thankful of Ron Baron and his league despite all of the problems it had… The Continental Baseball League was a bridge for the new upstart Pecos League of Professional Baseball Clubs. The Las Cruces Vaqueros will play games in 2010 at Apodaca Park in Las Cruces. Big Bend Cowboys — Home games are 7 p.m.(2 p.m. Sundays) at Kokernot Field in Alpine,Texas. Tickets: $6.50 bleachers; $7.50 chair-backs; $11 box seats. Information:(432) 249-0682. bigbendcowboys.com. We found a page on the old Las Cruces Vaqueros’ website which had several photos from 2010. These include photos of fans in the stands in Las Cruces, players from the Vaqueros and Big Bend Cowboys and Desert Valley Mountain Lions, and more. The page did NOT include a photo credit, so if you are the photographer then please contact this website to let us know so that we can give you proper credit including a link to your website and/or social media property if you wish. Norm Dettlaff/Sun-News Vaqueros first baseman David VanOstrand fields grounders Wednesday during practice at the Mayfield High School baseball field. Robin Zielinski/Sun-News Las Cruces Vaqueros Pitcher, Richard McNeal, pitches to his Desert Valley Mountain Lion opponent during top of the first inning on Sunday at Apodaca Park. Robin Zielinski/Sun-News Adam Kramer kicks and fires toward home plate as the Las Cruces Vaqueros hosted the Coastal Kingfish on Thursday night at Apodaca Park. The two teams will be in action throughout the weekend, with tonight’s game starting at 7 p.m., as well as Saturday’s. Sunday’s contest gets under way at 5. For results of Thursday’s game, log on to www.lcsun-news.com and go to the Sports section.